Neurosis’s 30-plus years of atmospheric alchemy and devastating tribalism has left an indelible mark on heavy metal and all its many subgenres, and with Fires Within Fires, the legendary quintet show no signs of internal fatigue. Anyone who has surrendered to Neurosis’s discography will find many psyche-rattling trademarks of their often copied sound present and correct here, and in that respect there is very little that will surprise the faithful. But as with Swans, familiarity when it comes to a band this self-assured is definitely a positive attribute – especially when the equally peerless Steve Albini returns once again to engineer proceedings. The introspective works of Steve von Till and Scott Kelly’s solo side-projects have bled heavily into their primary band’s ritualistic music since 2004’s The Eye Of Every Storm. That tradition goes on here, with their takes on dark Americana casting a sizeable shadow across Broken Ground and the sprawling slow-burn of closer Reach. 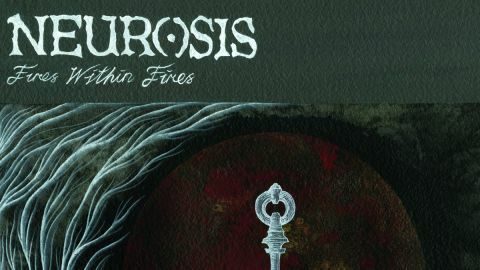 Yet unlike the more recent albums, Fires… finds Neurosis in surprisingly succinct form, its five songs spanning a focused 40 minutes. Unlike the majority of music from their post-metal followers – and even some past Neurosis songs – every monstrous sludge riff gnashes menacingly for the right amount of time and every delicate moment of folk-inspired drift is emotionally exacting, occurring as naturally as the daily ebb and flow of the tides or the unexpected eruption from an ancient volcano. Such efficient songwriting is only possible after years of careful refinement, and as expected, plenty of concentration is required to absorb the subtle intricacies throughout. In contrast, immediate primal satisfaction is also experienced whenever these five veterans coalesce into a world-devouring groove, as apocalyptic mantras roar down upon us. Spiritual, inexorable, a seismic force of nature – Neurosis continue to create art without equal and Fires Within Fires is another worthy addition to an awe-inspiring canon filled with truly pioneering and timeless albums.